New price: £ 299 - 698 DM - $450... CHEAP !! | S/H price: ?? Well, I saw this unit in SOS, and thought i'd bung it in the list..... dont have anything other than spec's, so I'll post 'em up, and if any of you uses one, then please add as many useful user comments and notes as possible... Cheers ! 24dB resonance filter (low pass), resonance/emphasis adjustable up to self oscillation !! Finally, a REAL analog synth for the 90's! Great sound- similar to a SH101 / MC202. The LFO's are very unique. You get two independant LFOs that go into the audio range for some interesting modulation effects. had one for few months and i am happy with it. usable, but can't have it all for this price. anyway, a real bargain, this one. Great box! You can really create a lot of different sounds with it (some of them quite extreme) once you get the hang of it. Especially the fact that the LFO frequencies have a range that goes all the way up to about 5 kHz gives you a lot of possibilities. I have one that I use primarily for basslines, but I would like to have another one, just for "special effects". and it takes about half an hour after switch-on (depending on the room temperature I found out!) to stabilize the VCO. But hey, look at the price! I like my new 404, but I don't love it. 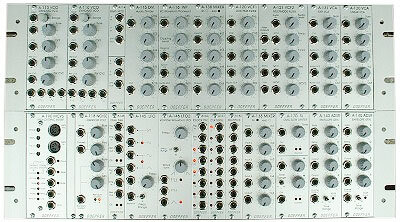 So, o.k., in my opinion the doepfer's a real nice thing to enter "the world of analogue synthesizers". It definitely makes me want more. 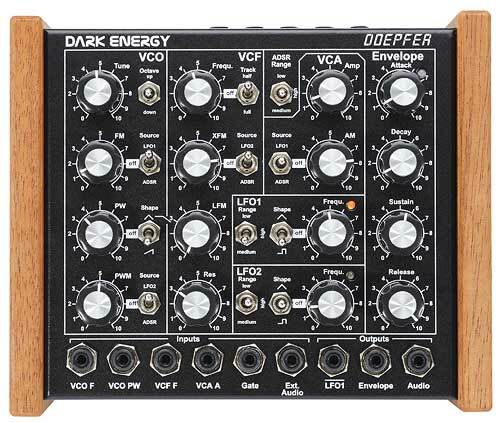 I have used this unit for over 3 yrs.Hands down the funkiest sounding single space synth around.Audio range LFO,audio range resonance(filter self oscillation),combined w/big fat pulse waveforms=torn,dripping, acid noize.This thing rocks.Only limited units are still available as far as I know,but they're only $360 US.A little noisey,and the knobs are a little cheap,so you've been warned.My finalizer cleans it up nicely,and it has never needed service. Check my website in about 2 weeks for music produced using the 404 and other new analog synths.You better buy it now from Enport it's only $360 until they are gone(out of production)this synth has been around a while.It's a little noisy but I have a Finalizer96k so your results may not be as clean as mine.If you like single osc. monosynths this one is good. You can probably clean it up w/ a dbx 166 those are pretty cheap.